Maximum track slope: 60°, Lift hill maximum slope: 25°. Special track elements: Banked Curves, Banked Helix, On-Ride Photo. 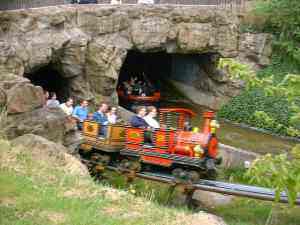 Other info: The Mine Train is all about fast, smooth, twisted track, and can be improved considerably by adding tunnels. Maximum Ride Capacity: 78 guests, Vehicle Capacity: 2 passengers in first car of train, 4 passengers in succeeding cars.